In the reign of Henry the eighth a James Hatton had been rector of Long Ditton, but just how, if at all, he fitted into the family tree is uncertain. Robert Hatton is first found as a student in the Middle Temple in 1606, in the chambers of his kinsman, Thomas Evelyn. Forty years later, after a long career, he had risen to be the Temple's treasurer. (10) By then he had become a serjeant-at-law and in 1628 he had been elected as recorder of Kingston upon Thames(11). Kingston had the unique distinction of being the only borough in the kingdom the burgesses of which held the right themselves to appoint a recorder for the town, and not to have one imposed upon them by the crown. A power confirmed by a charter given by Charles the first. (12) Two of Robert's sons were subsequently also honoured by being chosen to fulfil this office. An achievement unique in the borough's history. Richard Hatton, Robert's father, had in 1573 purchased the manor of Waterville in Esher, which Robert later inherited. In the same year in which he became recorder he transferred it to Kingston Corporation(13), but whether the two events have any connection is hard to say. His maternal descent from the Evelyns made Robert a cousin of John Evelyn the famous diarist and arborealist, who twice mentions visiting him here. On 10 January 1642-3 he records: "I gave a visit to my cousin Hatton, of Ditton" (15); and on 10 October 1647: "To Hampton Court, where I had the honour to kiss his Majesty's hand, and gave him an account of several things I had in charge. I lay at my cousin, Serjeant Hatton' s at Thames Ditton, whence, on the 13th, I went to London"(16). In spite of the monarchist leanings of his cousin, Robert Hatton appears to have been treated well by the Roundheads. Under the Commonwealth he was progressively appointed a justice of the peace for Surrey, justice of assize for the counties of Berkshire and Oxfordshire(17), and in 1655 a commissioner for the north of England(18). He married Alice, the daughter of William Haynes of Chessington, from whom he inherited a large estate there, which supplied the family with considerable income until it was sold by his grandson in 1742(19). Alice presented him with thirteen little Hattons. Robert Hatton died on 31 March 1661, and was buried with his parents at Long Ditton(20). The monument erected to his memory includes the inscription "QUI IN PERITIA LEGUM" - "skilled in law" (21). Like many lawyers, both before and since, he seems not to have taken the good advice he probably often gave to others, and departed this life without making a will. However, probate was granted to his eldest son, Sir Richard Hatton, who then moved into Fords(22). Sir Richard was also a member of the legal fraternity. His career proceeded very much along the same lines as his father's - student at Oxford, a member of the Middle Temple, called to the bar, justice of the peace, and recorder of Kingston(23). He married a wealthy widow, daughter of a baronet(24), with whom he acquired a large estate in Essex, part of which was expropriated by the government for the extension and strengthening of Tilbury Fort, needed for the protection of London during the Anglo-Dutch wars, and for which he struggled for many years to get paid(25). He had been knighted by Charles the first at Oxford in 1645(26), soon after becoming a barrister, and at the Restoration he was appointed a gentleman pensioner to Charles the second(27). Although the Hattons had by now become well established as one of the most important families in Thames Ditton, at the end of their lives they had always been interred at Long Ditton with their ancestors. Sir Richard, however, wishing to secure for them a place in the parish befitting their wealth and influence, as well in death as in life, had a chapel erected on the north side of St. Nicholas' church in 1676 especially to receive their remains. To remind lesser souls that this was the family necropolis of great people, over the entrance of it was prominently displayed the words "DORMITORIUM HATTONIANUM" (The sleeping place of the Hattons), and the coat of arms and crest of the family was emblazoned in stained glass in the window(28). His action in having this chapel built was probably prompted by his own ill health and the suspicion that his life was drawing to its close, even though he was as yet only fifty-five years old. On the 13 December 1676 "being infirm of body but of sound and perfect memory", he made his will (29). The following week he resigned the position of recorder of Kingston (30), which was immediately offered to his brother, William(31). Within two months he died, and his body was the first to be laid to rest in the mausoleum he had created(32). Shortly after to be followed by that of his sister, Mrs. Mary Windsor(33), who in her widowhood had lived with him for several years(34), and acted as a sort of universal godmother to the many Hatton offsprings(35). Sir Richard's will reveals well the extent of the family's acquired wealth. As always at that time invested in property(29). Besides Fords, it included other lands and houses in Surrey - Thames Ditton, Long Ditton, Claygate, Tolworth, Malden, Kingston, and Chessington; a house in the Strand, and another in St. Paul's Churchyard, in London; as well as the manor of West Tilbury in Essex (On which the government still owed him money). Both these last two he had obtained by marriage to his wife, and illustrates well how the family's fortune had been succoured by such prudent connections. Most of this property was left in trust for his wife, Lady Anne Hatton, for her life, and then in tail for his heirs. Lady Anne's widowhood lasted only two years. She died on 9 June 1679, and was laid to rest by the side of her husband in the Hatton chapel(36). The estate then passed to her eldest son, Robert. Robert Hatton carried on in the family tradition. After Oxford, he read jurisprudence in the Middle Temple, but never seems to have practised. Instead he carried the role of country gentleman. Soon after his father's death he was raised to the knighthood, at the youthful age of twenty-seven(37), and in 1682 he was appointed to the important office of sherriff of Surrey(38). He was, however, a sickly man, and in 1680, not long after having entered into his inheritance, probably viewing the future with uncertainty, and to make certain of "continuing the family estates in the name and blood" of the Hattons, he transferred "All that mansion, messuage, or tenement, in which the said Robert Hatton then dwelled, with all edifices, buildings, barns, stables, yards, gardens, orchards, backsides, and appurtenances theretofore called or known by the name of Fords, in Thames Ditton", to trustees. For his own use during his lifetime, and if he died without issue, to go to his only brother, Richard, and to his heirs, and then to his uncle, William Hatton of East Molesey(2). His "indisposition of bodie" continued, on 22 June he drew up his will(40), and in the following May he died. He too took his place in the family chapel(41). He had married in 1675, Cecilia, the daughter of Francis Brewster of Wrentham Hall in Suffolk(42), but they had had no children. His only brother, Richard, had predeceased him some years earlier, without having been married(43). The inventory compiled for obtaining probate of his will provides a good insight to the furniture and household goods which might be found in an upper class residence at that time. It lists the following rooms: on the ground floor, a great parlour, little parlour, dressing room, study, and store, all containing miscellaneous items of furniture. In the hall was two tables and four old leather chairs or forms. Pictures hung along the passage and "upon the stare case". The pantry contained five tables, an old cupboard, and a hanging shelf. The other domestic quarters consisted of, kitchen, wash house, dairy, and buttery. On the upper storey was, the great chamber complete with ante chamber, the best chamber, the white chamber, the chamber over the study, the chamber over the kitchen, and the chamber over the pantry; all containing one feather bed and other furniture. The servants all slept in one chamber, in which there was nine feather or flock beds. The valuables included, a quantity of ready money, some silver plate, and dozens of knives and forks with silver handles (No mention of spoons). The farm yard included six bullocks, four hogs, thirty-five sheep, miscellaneous poultry, calves, and a load of hay. The stables had six horses complete with saddles, coach and harness, six other horses, ploughs, harness, and "other lumber out of doors"(44). 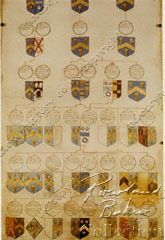 Portion of parchment roll showing the pedigree of Sir Robert Hatton of "Temsditton"
Surprisingly this has some strange omissions which are hard to explain. Firstly, it calls Sir Robert's father just Richard Hatton and not Sir Richard; Secondly, William Hatton, Sir Richard's brother is not shown at all. Under the terms of the deed of trusteeship and of Sir Robert's will the estate now passed to his uncle, William Hatton, who had his own mansion at East Molesey. However, the marriage jointure settlement agreed to before Sir Robert and Cecilia's wedding stipulated that in the event of her being left a widow she should be allowed to continue living in the house. Therefore, in November 1684 she concluded an agreement with William Hatton to enable her to enjoy the residence during her lifetime, but that the freehold of inheritance vested with William and his heirs(2). Two years after her husband's death, being then still in her early thirties, Lady Cecilia married William Nuthall of Kingston, a long-standing friend of the family(45). Her married life was yet again to be short lived. She married for the third time a middle aged baronet and member of Parliament, Sir Harry Dutton Colt. During the Civil War Colt had been adjutant to Prince Rupert(46). He was living here in 1705, for he voted in the general election of march of that year, and again in October 1710, in respect of this property(47). Lady Cecilia died in October 1712(48), and was probably also buried in the Hatton chapel. Unfortunately the parish burial register for Thames Ditton covering this period has been lost and it has not been possible to confirm this. The chapel has since been rebuilt as a vestry, but the funeral slabs with their inscriptions are though still to exist beneath the wooden flooring. Meanwhile William Hatton, the owner of the freehold, had died in 1705 and had been buried in East Molesey churchyard(49). Under his will(50) he left "my capital messuage wherein Dame Cecilia Hatton now dwelleth called or known by the name of Fords situate in Thames Ditton" to his great nephew, Hatton Tash junior grandson of his sister, Thomasin, widow of Sir George Tash (See genealogy above).